After strong U-20 National Team play, could Akpan leave Harvard early for the pros? The world of big-time college soccer is a lot like the world of big-time youth soccer. To navigate the terrain of either place is to succumb to an essentially nomadic existence. It’s a choice that many Americans are willing to make. Coach John Kerr of the Harvard men’s soccer team takes approximately 10 to 12 trips per year to the nexus of both worlds: club, regional, and high school tournaments, and recruiting showcases from Southern California to Disney World. Some of the trips he takes with assistant coach Gary Crompton. For others, Harvard’s coaches divide up duties, fanning south and west across as much ground as the university budget will allow. This year, word of the Harvard’s brilliant fall season, in which the Crimson finished No. 13 in the national rankings and coasted through the Ivy League schedule with the nation’s third-best scoring offense, is traveling faster than Kerr and his assistants. From coast to coast, the nation’s top high school prospects are asking about Andre’ Akpan ’10. Broad-shouldered and solid at 6’0, 190 pounds, and wearing the tawny, tightly wound curls of a buoyant Afro, Akpan is a striking presence with an easy smile. On the pitch, he is difficult to miss. The Grand Prairie, Tex. native works smoothly and runs upright. Rarely does he appear caught out of position, or uncertain with his feet. Akpan is especially masterful at operating in tight spaces and navigating the bedlam that surrounds loose balls and broken plays. It’s a typical Harvard story, the struggle to order and organize chaos, to make sense of the unpredictable. But there is little that is typical about Akpan, not least because the Harvard freshman has put himself on a track that could very well lead to international fortuneand fame—perhaps sooner than you think. “The future is unlimited for this player,” Kerr says. Already, Akpan is dreaming of a career in the high-paying ranks of professional soccer. As early as his teenage years, when he starred at forward for the prestigious Dallas Texans soccer club, he attracted the attention of top college scouts. But never has Akpan received as much attention as now. Kicking off one outstanding two-week stretch in January, Akpan joined 17-year-old phenom Freddy Adu and a roster full of international veterans in making the final cut of the United States Under-20 Men’s National Team—which was itself a surprise until Akpan outran everyone in the 40-yard dash (his time: 4.60 seconds). Akpan took it one step further, earning a surprise start in the team’s first game of the CONCACAF World Cup qualifiers in Panama City against Haiti on Jan. 17. He immediately justified U.S. Coach Thomas Rongen’s trust, scoring a hat trick, and nearly adding a fourth goal, in a 4-1 win. “Andre the Giant,” read the lead headline on ussoccer.com, the official website of the national program, that afternoon. Akpan appeared unflappable throughout the performance, a rookie among pros, launching shots with abandon. Only a stirring rendition of the national anthem, he says now, and the presence of FIFA’s distinctive yellow “fair play” flags, reminded him of the grandiose nature of the event. That’s when the interview requests rolled in—mainly from websites for soccer junkies, including ESPN.com’s popular Soccernet site. Message boards lit up with requests for more information about the unknown Ivy Leaguer. Soccer bloggers raised their eyebrows—“I can’t find too much fault with his game,” read one blog called Du Nord—and simultaneously downplayed Akpan’s performance against an unexceptional Caribbean team with a middling goalkeeper. Akpan was shut out in subsequent games against Guatemala (which the U.S. tied, 0-0) and Panama (5-0). Today, Akpan is still considered an outside shot for the final roster of this summer’s U-20 World Cup in Canada. Thriving there would be a critical component of any courtship by professional teams from Major League Soccer (MLS) or Europe. Sooner than you think: that’s how fast Harvard’s breakout first-year could bolt Cambridge for a professional contract. There is little precedent for Harvard athletes who willingly jettisoned their degrees for the pros, as tennis star James Blake did in 1999. Recent baseball players Zak Farkes, Frank Herrmann, and John Wolff, all of the Class of ’06, signed minor-league contracts and left a semester short of graduation, but all three were on pace to earn their degrees in January. Only Kevin Ara ’04, Tom McLaughlin ’98, and Will Kohler ’97 among recent Harvard soccer players held roster spots in the MLS. All three earned their degrees on time, and all three retired from the league after brief tours. The fact is that Akpan’s case has no precedent, and a decision either way would require careful consideration. Professional sports culture remains a touchy subject at Harvard, which prides itself on the amateurism of its athletes (one reason why neither the school nor its Ivy rivals offers athletic scholarships). UCLA, on the other hand, which beat Harvard in the second round of this year’s NCAA Tournament, lists 24 professional soccer alumni at home and abroad on its school website. Harvard Director of Athletics Bob Scalise returned a request for comment about Akpan’s situation by e-mail, writing merely that “I have not heard of the possibility of Andre’ going to the pros” and deferring future requests to Kerr. Rockey Akpan understands the dilemma. Andre’s father grew up in Nigeria, where education is the key to wealth, status—“everything,” Rockey says. Like so many young African students, part of a movement initiated by President Kennedy to encourage immigration from the continent, Rockey arrived in the United States in the early ’70s, looking for opportunity in the post-Civil Rights era. He found it at the University of Wisconsin-Eau Claire, where he received his degree in 1975, and in Minnesota, where he earned his master’s at Mankato State and went to work for the Burlington Railroad. Years later, after spurning Duke for Kerr and the Crimson, Andre’ matriculated in Cambridge—“a dream come true for me, personally,” Rockey says. The elder Akpan’s first love, however, was soccer. The Nigerian national team of his youth, nicknamed the ‘Super Eagles,’ had not yet evolved into the World Cup contender of the early ’90s, and so young Nigerian boys cast their eyes west to Brazil, where Péle was capturing the world’s imagination. Akpan’s career brought him and his young wife, Bette, an American from Wisconsin, to Texas. In Grand Prairie, a large suburb of Arlington, itself a major satellite city of Dallas, the Akpans went about raising a family. Soccer brought the Akpans—especially sons Adrian and Andre’—close together. “I was tickled to have kids who really liked sports and got into it,” Rockey says. Arlington is fertile ground for the sport. The city supports a multifarious fitness culture that has more in common with the suburbs of California than the football-addicted small towns of South and West Texas. A hotbed of diversity—immigration from soccer-mad Latin America, East Asia, and Africa helped the city grow to become the nation’s 50th largest (and counting) by 2000—it never lacked the competition that would help develop Andre’ into a star on the club circuit. Early on, Rockey put his sons in a position to succeed. Andre’ remembers being dragged out of bed on Saturday mornings as a child to practice with a team full of boys who were four years older. It was Adrian’s U-12 team, and Rockey was the coach. Later on, Rockey put Adrian and Andre’ on the women’s National Team training program, which he had found while leafing through an old magazine. The brothers’ summer fitness regimen included weight training, running drills, and zooming around obstacle courses at the local YMCA. Chairs, boxes—nothing was so ordinary it couldn’t stand in for a defender. Andre’ drilled with his father for two and three hours at a time. The program was the genesis of young Andre’s improvisational virtuosity. He learned how to shoot. He learned how to pass. He built his game on a foundation of ball-handling tricks, like the move that Harvard teammate Cheyoon Im calls “the fisherman’s touch” (hint: imagine reeling in a defender, then blowing by him). 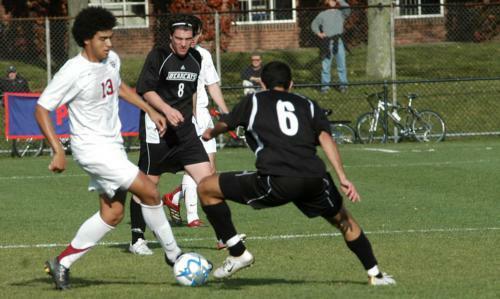 By the time Andre’ had finished his club career with two national championships to his credit, graduated from high school with exactly 100 career goals after a hat trick in his final game against one of the state’s best defenders—“He deserves every accolade he gets,” says Akpan’s Oakridge coach, Jason Kern—and made his choice of Harvard over Duke, John Kerr could see elements of Eric Wynalda and Claudio Reyna in the young attacking midfielder. Kerr does not blush when he compares Akpan to recent luminaries of the Team USA program. But Andre’ also knows this: he has wanted to play under the lights of Highbury and Old Trafford for far longer than he has dreamed of entering the corporate world. The window of opportunity is small. He can always return to school later. And that’s why Rockey and his family will give their blessing if a sizable contract in a favorable professional setting comes along. That’s why, according to Im, Andre’s teammates “would gladly support the guy” if he left them. Still no offers yet. But don’t blink now—at the center of Harvard’s rising program is a young man who could be gone in a flash. And sooner, perhaps, than you think. —Staff writer Alex McPhillips can be reached at rmcphill@fas.harvard.edu.